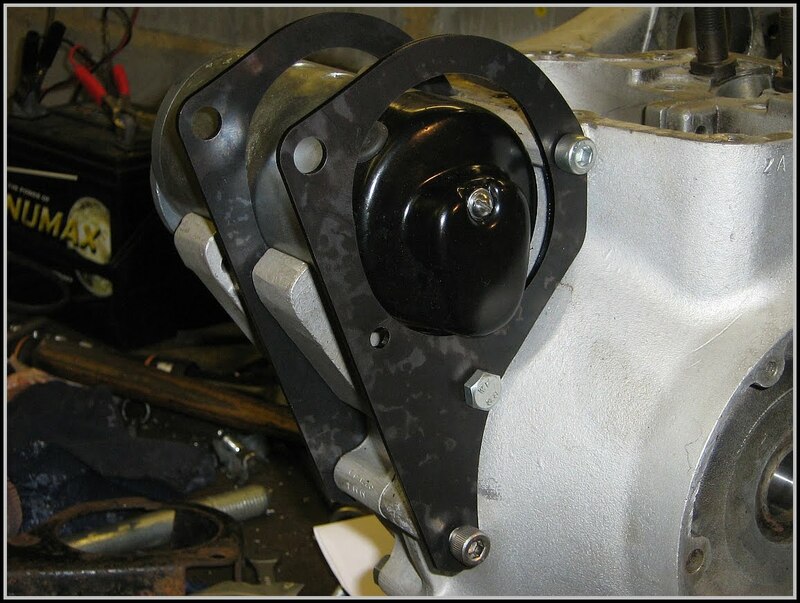 Been having problems tracking down a set of front engine plates, bought a second hand pair from Draganfly the other week, one was really battered and fitted the other was pretty reasonable and didn't. I reckon the dodgy one is from a later plunger twin, once again they look very similar but the subtle differences will screw ya every time. Spoke to me ol' mate Barnsley Shaun, who's recently scored a project long stroker off of Pete Stansfield about copying the pair he got with the deal. Spookily enough it turns out that he's in the same boat, timing side fits fine, drive side is a non-starter, close but no cigar. What Shaun was able to do though was draw around the good one and give it to his laser cutting man and get a couple of pairs knocked out. When I've had cutting done it's always been "supply a CAD .dxf or .dwg file" didn't know that could simply send a drawing to some places. Offering them up on the spare cases they fit the crankcase holes perfectly. 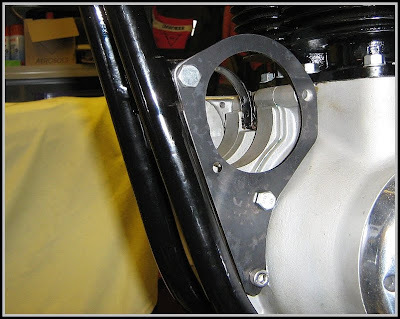 On the bike there is a little discrepancy, but that is probably due to the rest of the engine mounts being in place, hopefully it's a matter of slackening the rest off and letting everything relax and the holes may come back the 1/16" needed, rather than get the round file out. Shaun you're a star mate, thanks!